I have to admit, this one snuck up on me. To be fair, it seems to do that to me every year; you’d think a writer like me would be a bit more cognizant of the National Book Festival, especially since it’s right across the Potomac every September. BUT! Just because I’m lame doesn’t mean you should be! 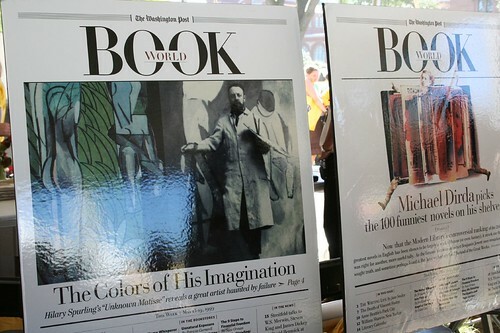 The National Book Festival will go on, rain or shine, as scheduled tomorrow from 10 a.m. to 5:30 p.m. Located on the National Mall between 3rd and 7th streets, the festival is free and open to the public. Over 70 authors and illustrators will be present this year, including Tiki Barber, Marc Brown, Neil Gaiman, R.L. Stine, Brad Meltzer, Richard Price, Salman Rushdie, Rick Atkinson, Cokie Roberts, Bob Shieffer, Arthur and Pauline Frommer, Michelle Singletary and Michael Lind. Artists and authors will discuss their work within the various pavilions dedicated to particular subjects. The Pavilion of the States will highlight reading, literacy and library promotion activities in all 50 states, DC and territories. New this year are presentations by young poets and artists in the Children’s Pavilion. Each presenter is a winner of the River of Words environmental poetry and art contest that was sponsored by the Library of Congress’ Center for the Book. Currently available on the festival’s website are downloadable podcasts of various interviews with authors. You can check here for a full list of participating authors, in case you’ve got a hankering for some autographs. And for those of us unable to attend, make sure you take lots of photos and share them on our Flickr page!